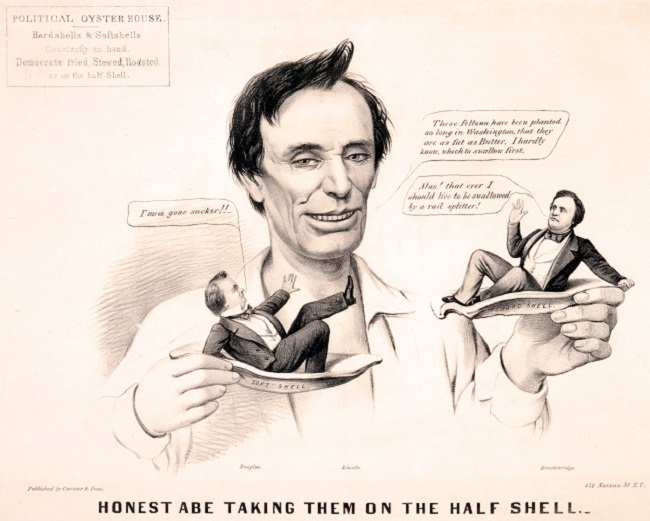 “Honest Abe Taking Them on the Half Shell.” Currier and Ives cartoon, 1860. Captions: “POLITICAL OYSTER HOUSE: Hardshells and Softshells constantly on hand. Democrats fried, Stewed, Roasted or on the Half Shell.” Lincoln: “These fellows have been planted so long in Washington, that they are as fat as Butter. I hardly know which to swallow first.” Stephen A. Douglas, on the left, a “Softshell” (moderate Democrat): “I’m a gone sucker! !” John C. Breckinridge, a “Hardshell” (steadfastly proslavery): “Alas! that ever I should live to be swallowed by a rail splitter!” Courtesy of Prints and Photographs Division, Library of Congress; enhanced for use by John Osborne, Dickinson College. When Abraham Lincoln became the Republican Party presidential nominee in May 1860, there was a sudden demand for information about the relatively little-known candidate. No fewer than thirteen biographies quickly appeared, including Life of Abraham Lincoln, by John C. Scripps of the Chicago Press and Tribune. 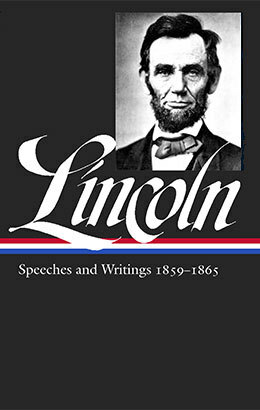 This 32-page booklet enjoys a certain prominence among historians because the biographical sketch that Lincoln wrote especially for Scripps still exists. When the Chicago journalist pressed Lincoln for information on his early life and background, the candidate responded, “Why Scripps, . . . it is a great piece of folly to attempt to make anything out of my early life. It can be condensed into a single sentence, and that sentence you will find in Gray’s Elegy, ‘The short and simple annals of the poor.’ That’s my life and that’s all you or any one else can make of it.” Yet Lincoln ultimately acceded and the opening pages of his sketch describes the little he knew of his ancestry and a few amusing or folksy anecdotes from his youth. There are three sections in the sketch that require elaboration for those not familiar with Lincoln’s political career. Much mention is made about Lincoln and “rails.” This campaign theme began when John Hanks, to reinforce the bona fides of Lincoln’s humble beginnings, brought to the Republican convention two fence rails supposedly split by the candidate himself in his younger days. From this bit of political theater Lincoln earned the nickname for the duration of the campaign as the “Rail Splitter.” Lincoln also makes much of the Mexican-American war, an issue that dominated much of the second year of his single term in the House of Representatives from 1846 to 1848. As a Congressman, Lincoln argued that the war began with an act of aggression by General Zachary Taylor, following orders of President James Polk, against Mexican territory and that entire war was unconstitutional. Lincoln voted for a resolution against the war but also voted to fund the conflict, arguing that, once the conflict had started, Congress had no choice but to supply the troops. His opponents attacked him for his alleged lack of patriotism and consistency right up through the 1860 presidential campaign. Note: On page 165, Lincoln refers to a protest against slavery he and a colleague presented to the Illinois legislature in 1837. You can read that document here. This week’s selection was suggested to us by Ben Ostrander of Austin, Texas, as appropriate reading not only for Lincoln’s birthday but also for the current campaign season. Abraham Lincoln was born Feb. 12, 1809, then in Hardin, now in the more recently formed county of Larue, Kentucky. . . . If you don't see the full story below, click here (PDF) or click here (Google Docs) to read it—free!